Most SUVs have roof luggage racks that allow you to carry more items. Here are five steps on how to use a luggage rack. Measure your container to determine whether it fits on the roof of the car without the carrier hanging over the windshield. For cross-bar luggage racks, the container should fit inside the square. Choose a durable weatherproof container in case it rains. Put the container on top of the SUV first. Then pack your items in it. Fill the container completely to prevent flapping during vehicle movement. Finally, attach the container to the luggage rack using at least four cam-buckle straps extending from front to back and two over the sides. Follow these tips, and you’ll get your container safely to your destination. 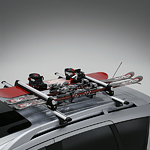 Purchase your next SUV with a luggage rack from Sesi Volvo.